I'm giving a presentation and having a book signing and raffle in Lincoln, Nebraska. You in? Raffle prizes include signed books, t-shirts, local goods, seeds, plants, and garden tools. Party on! If you want to order a signed copy of the book and have it mailed to you go here. And if you aren't following my new blog address, why not? The Deep Middle has moved! I'm trying to consolidate my life and make it more streamlined. So the blog will now be at my main website linked here. 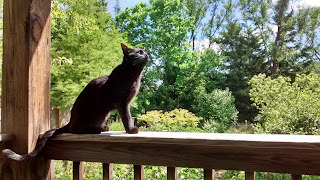 It's been 10 years on blogger at this web address, sharing my poems and memoir here and there, and certainly tons and tons of garden pics. 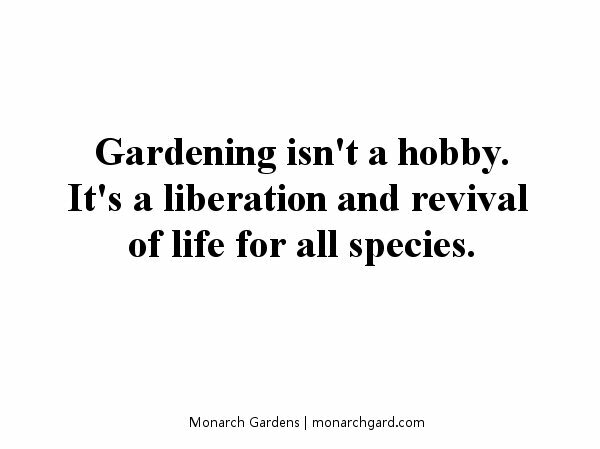 Not to mention environmental / garden philosophy. Now all of that will be at Monarch Gardens LLC, as well as my many social media pages (Milk the Weed on Facebook, Twitter, and Instagram). Two weeks ago I heard a calling from under the ceder trees. I swear, local cats must put hobo signs on our fence. There he was, a scrawny kitten about 4 months old, meowing his head off. Of course I befriended him. 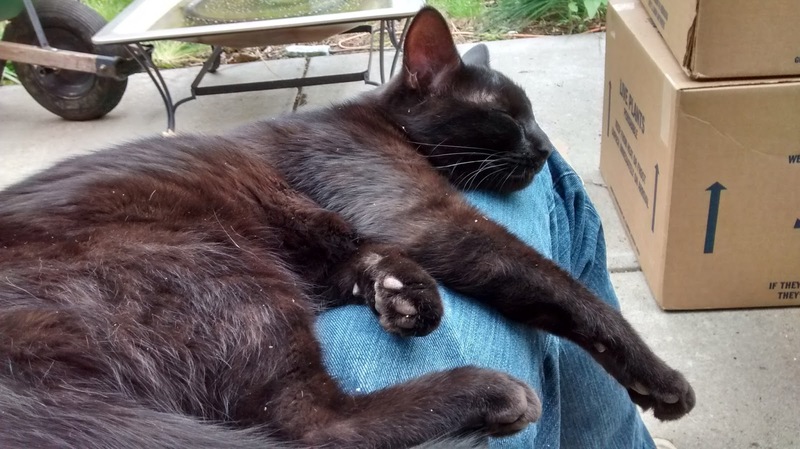 He'll sleep on my lap purring for as long as I can hold still (current record 45 minutes), follow me around to check on plants, and he loves chasing sticks and eating grass. I'm not sure he often leaves our garden as he's always there when I go out. He is extremely docile and not yet a hunter or fully adapted to outdoor life, so I'd like to find him a good home before he decimates birds or becomes feral. Our older cats -- 13 and 16 -- can't embrace his energy (which isn't really all that much). And we already adopted a young stray in 2015. We'll pay for a vet checkup and half the neutering if you are ready to fall in love. And it won't take long to fall in love. Seeing him leave will be highly emotional, but if it's to a fantastic home it will sting less. Email if interested. A few shots of how things are looking. I still prefer autumn and winter -- spring is so blah. And everyone is mowing, blowing, and mowing again. I don't know on chokeberry. I am far too in love with my slab of steel. 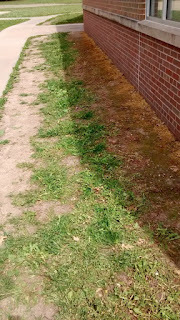 Summer #2 for the meadow sown into fescue lawn. 500+ seedlings! Whenever I see the word "beauty" used to describe a plant or garden, I cringe on the inside. Beauty is an abstract term based on highly personal and complicated emotions, which are filled with subjective human experiences. While one person may perceive something -- a landscape, a moment -- as beautiful, another may be witnessing ugliness or discomfort. This is true for other species. Which species of bird, butterfly, spider, bee, or soil microbe find our gardens beautiful? How is that beauty measured and for what purposes? Beauty may be a condition of being useful. For humans, a garden is useful because it tickles our senses and stirs an emotional response, which helps us engage and bond with the world around us. The garden is a contrived space, though, like a painting or music, even as it carries usefulness beyond our own species. But the way in which we and other species find usefulness and beauty are often very different. Leaving stems 1-2' tall in spring is useful for carpenter bees. Is it beautiful? To whom? The plants we use and how we grow them are not for us alone. It's not just the why of the endeavor, it's the how and for whom, and when. A hosta is for us -- we find it beautiful, or, we've inscribed meaning on it in some way (my grandmother grew them and I remember her in this way, or, I like the texture of the large leaves). But for most wildlife, hosta is ugly and useless. Very few to no species lay eggs on the leaves, or evolved to recognize or thus be able to use the pollen or nectar form the blooms. By using a hosta, we privilege ourselves over the functioning landscape and erode beauty for the real world -- the 99% of other species we depend upon to have the luxury to discuss beauty or meaning in plant arrangements. A garden can be beautiful and useful for all of us at once. It can practice reconciliation, community, understanding, and equality. The way is through native plants, because the way is through displacing our perception and conception of arranging nature solely or primarily for ourselves. Garden making, especially in the altered urban world, is a translation matrix between the wild we've forsaken and the wild we yearn for in our bones (even if we don't know what it is or how to name it). 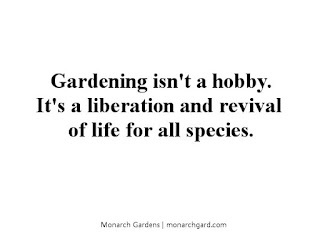 Garden making is a sacrifice that elevates the world around us not purely through our artistic vision, but through elevating the needs of the real world. If we can't provide what's beautiful to other species, then our gardens are not, in fact, beautiful at all. Every year we drive 90 minutes west to view one of the coolest bird migrations on the planet. And every year before we go I wonder -- why bother? Why do people go year after year just to see the same thing? And then you stand out there among wave after wave of tens of thousands of birds, each calling out to the other with loud, ancient voices that echo from horizon to horizon. 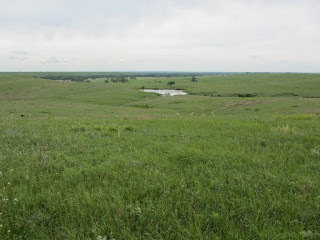 You feel the cool south breeze against your face, knowing that if you, too, had wings it would take very little to lift off with the flocks and settle toward the Platte River for night. There, among birds that mate for life and have been coming through this small area for millions of years, you feel power rise up within. Power you never knew you had but suspected was there. The power is joy and it is also rage. The power is compassion and defiance. You want to go screaming into the nearest city, asking why we pollute, why we turn over the earth, why we have lawn, why we don't see the community as preservation and healing for the self. So every year we will go see the cranes to be reminded. And we will hope to be reminded in other ways as hands hit soil, place plants for butterflies and bees, and travel to meet new people who have the same power resting inside. Each turn toward wildness is an act of defiance -- and the most profound love one can have. A massive flock agitates and rises toward sunset. It is very rare to see cranes standing in the middle of a road. The recent Cheerios-sponsored wildflower giveaway to save the bees was fraught with problems. First, saving the bees does not mean honey bees, which are imports and globally stable. 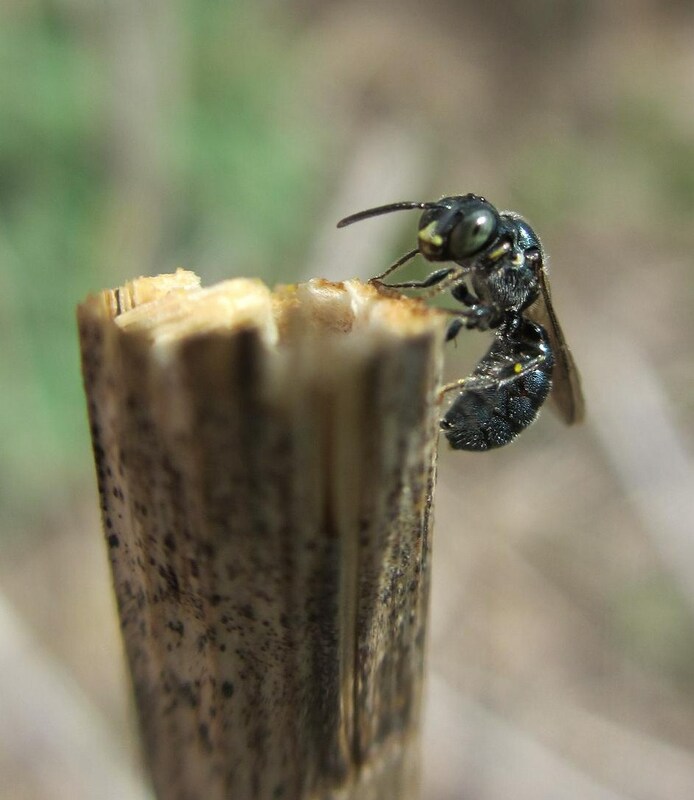 Honey bees also out compete are more valuable native bees for resources while spreading disease. Second, many of the seeds were exotics, some invasive. And of the native seeds included, they may or may not be native across the country, thus also potentially invasive. In addition, the seeds were provided by a Monsanto-owned company. Third, a recent study showed high levels of glyphosate in Cheerios, higher than is allowed and that could be toxic, especially to kids who eat the cereal often. Previous studies have shown arsenic in Cheerios. It's clear Cheerios uses ingredients sourced from unsustainable agricultural methods -- methods that surely harm lot of bees, pollinators, and other wildlife. Cheerios gave away 10x the seeds they were going to, and in very quick order -- only a few days. Folks jumped at the chance to do good, and while I'm all for corporations (even those that greenwash) to help lead the way, tacitly sponsoring a for-profit business with a dubious environmental background does raise some ethical concerns. Of course, we do live in a consumer-based, capitalist society where our leaders are brand names. We desperately want to do good by the bees and the environment. And companies like General Mills will play on that goodwill as a marketing tactic -- which is just how the system works. But, because we want to do good, and because we're eager to support any movement that offers a simple solution and confirms our beliefs or desires, we hand over critical thinking to someone else. This is dangerous, especially in a time of climate change and mass extinction. This all makes me think about butterfly bush, how so many believe planting it helps pollinators, when for many ecosystems it's a thug and / or supports only a limited number of adult pollinators. Or when we justifuy exotic plants like hosta, daffodil, or forsythia because we see a bee on them, then say well, these are helpful, too, without knowing what species are using the plant for forage or how the plant contributes to the ecosystem beyond its blooms. And don't get me started on using exotics to "extend the bloom time." What did pollinators do before we brought in exotics? We must think more deeply. Doing so is not being a downer or poo-pooing a wildflower seed giveaway -- instead, it will lead to greater empowerment and action because we are not blindly following what makes us feel good in an impulse, but what makes us do good through research and critical thinking over time. Are you ready for fall? Pre-order and get 20% off. Releases October 10! I'll be appearing at a few places. If you know of 2018 events please hook me up, especially as I'll be in book tour mode. 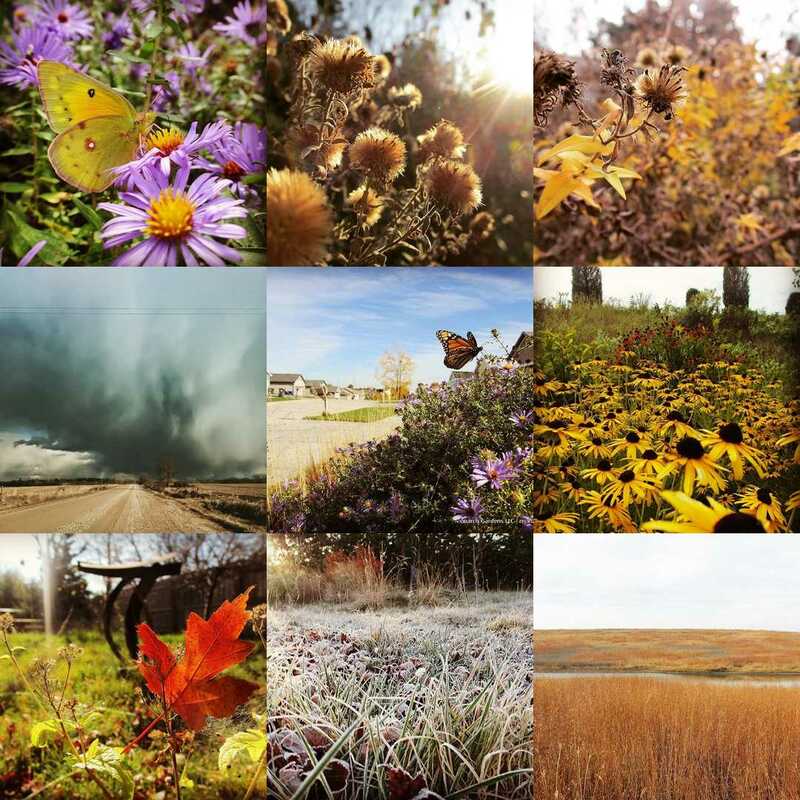 This year I'll be donating 5% of all garden design fees to local nonprofits that conserve, restore, and educate about the tallgrass prairie in eastern Nebraska. In a time of climate change, extinction, and regulatory rollbacks, it's incumbent upon us to act and think local -- and support the community of all flora and fuana. I'm also working with the Nebraska Wildlife Federation to design and install pollinator gardens at an elementary school, middle school, and a retirement center. It's very cool! And of course I'm always looking for more residential projects, both local and across the Midwest. One I've started will feature the extension of a bird flyway, hedgerow habitat for native bees, a bioswale, and vegetable beds. As far as I know the book is still on schedule for a fall release, date TBD. Cover is still being drafted and copy editing is in the early stages. 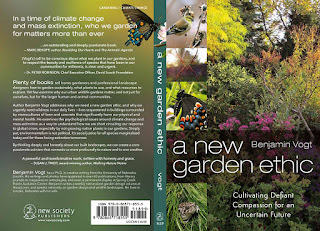 Title confirmed -- A New Garden Ethic: Cultivating Defiant Compassion for an Uncertain Future. 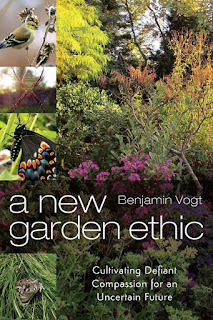 Again, the subject is the psychology and ethics of using native plants in a time of climate change and mass extinction, and lots of science of flora / faunal relationships with a dash of landscape design history and principles for a healthy urban future. It is very much a deep, reflective, activist style book. Our species has long had privilege over other species. Slowly, our privilege has begun to feel like a right -- something preordained. We can see this with white middle and upper class privilege. When anyone starts talking about the rights of others -- the poor, the immigrant, the transgender -- suddenly equality feels like discrimination for those with privilege. Perhaps the same thing happens when we discuss equality for other species and their landscapes. When we're asked to think critically about our privilege as a species -- where it comes from, what effect it has on others -- we feel marginalized, just like we've made others feel marginalized. And when we're asked to garden with native plants, and for the goal of helping others -- of creating equality -- humans feel attacked and minimized. And yet, there are those who feel empowered by empowering others, ensuring the rights of the poor, the immigrants, the transgender, the bees, the birds. They see equality not as a threat but a grand opportunity to practice our deepest-held beliefs as a compassionate culture and species. What happens when we privilege others? How do our ethical codes expand? What happens when we step back from our tunnel vision and expand the viewpoint to the perspective of others? What do you need to thrive? What do you need to be healthy? What do you need to be happy? Your thriving, your health, your happiness is mine in spades. And this is why when we garden for others our gardens will transcend their origins, and in some small way, instruct and be instructed by a larger social ethics and social justice. I see my garden as an act of compassion and justice. Instead of the tyranny and supremacism of lawn or mulch, there are diverse beds of flowers, grasses, shrubs, and trees. Wide varieties of wildlife throughout the year call the garden home, and I am enriched by their presence and their cultures, not diminished. Together the world and I meet in the garden, we embrace, we commune, we share our hungers, our losses, and our joys. Without the garden I would not know that equality and freedom are milkweed, bluestem, aster, and oak. Without the garden I would know less of the common language that binds us all together. "Native plants are the tip of a much larger iceberg. The conversation goes well beyond what is native and why or how gardens work. The very fact that we keep having this conversation in writing and seminars and podcasts, and that it makes some in horticulture uncomfortable, is evidence that we need to be having even larger conversations about why we garden and who we garden for, and what it means in a time of climate change and mass extinction. Our culture needs to be confronted in as many ways as possible for the sake of future human and non human species." And how about a picture from our ice storm this month -- because it won't snow this winter. More are at Instagram. In most cases, people will tend to believe what they already believe, unfortunately. 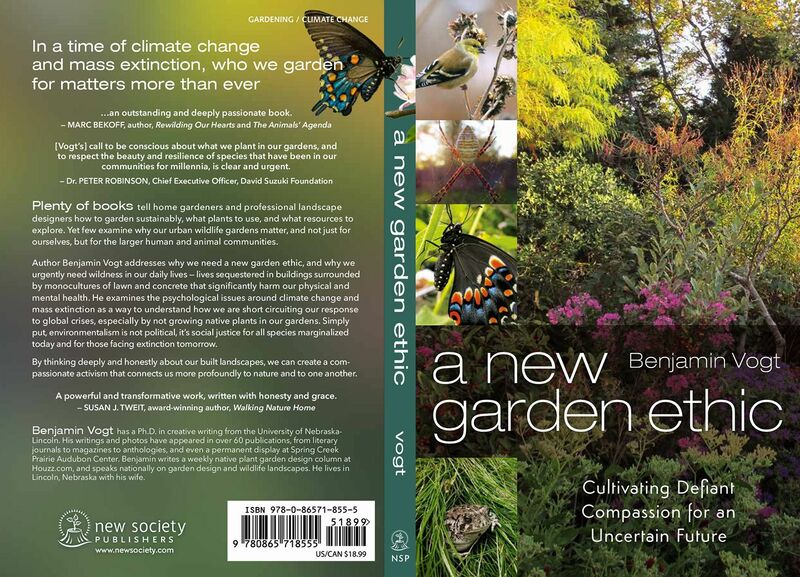 A core part of my forthcoming book explores the psychology of climate change and environmental issues, which I link up to what often becomes a very heated, very polarized conversation around native plants. I postulate that one reason the native plant conversation becomes either / or relates to how our minds have evolved to process new information as animals, and especially how new information tends to increase risks on our perception of self and our belief about cosmic order. Any time we face conflicting information our brains immediately put up defenses to protect us; any new perspective threatens our carefully balanced sense of right and wrong, our social and cultural beliefs, and our very ethics (and ethics that can't evolve fast enough with technology or climate change). I think the real mystery is how some people can quickly embrace new ideas, analyze, process, be open, and then if necessary reorder their beliefs and cultural viewpoints. Where am I going? Several times over the past year I've heard folks profess that Doug Tallamy -- native plant and pollinator researcher guru extraordinaire -- has toned back his viewpoint at speaking engagements. In particular, he's become more open to mixing exotic plants and natives in built landscapes, like urban gardens. I don't know if this is true, as it's been years since I heard Doug speak, and I don't know how much of this new change is filtered through folks who previously decried everything Doug said about native plants because, perhaps, it was threatening to their worldview, profession, culture, et cetera. 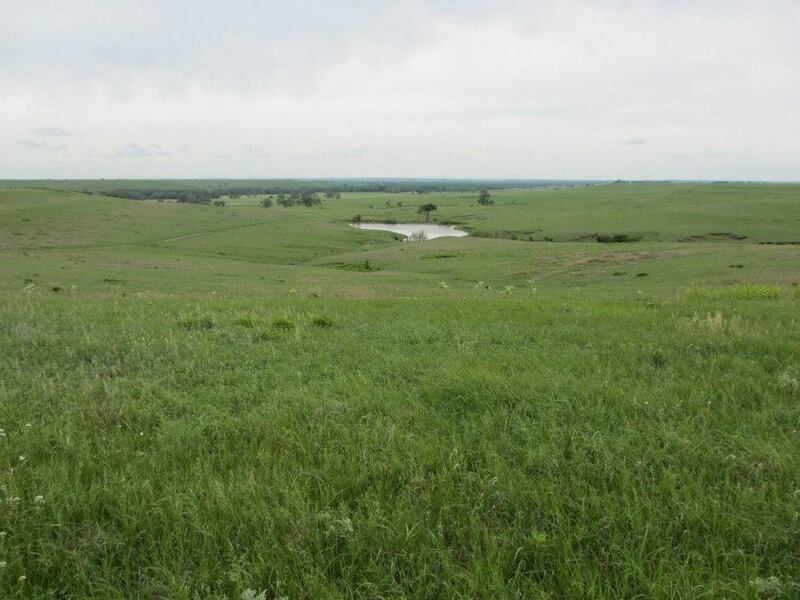 What I do know is that it seems, from my small data set of individuals, that the more Doug apparently opens up his hard-line stance toward using native plants only, previous critics are now pointing to him as a reputable source. I find this shift psychologically fascinating, and would like to learn how to exploit it. The power of Doug's message has always been one rooted in an activism based on a shift in our ethics, and I think his audience has always been the more progressive regular Joes among us (I'm not one of those Joes, or Janes). Even while his research has asked the horticulture industry to evolve, and they've listened in some ways, I believe his audience has always been homeowners -- and I think this is still where the greatest power resides. It's homeowners who are going to put pressure on the green and landscape design industry to build sustainable wildlife gardens in urban areas, and this sort of grassroots mobilization has always been what's worked -- from other environmental issues to classism to racism to sexism. No doubt we need large design firms to step up and give us moving, functional examples to emulate at home, and that we need tons of them right now, but I'm not yet sure how large their role will be from a cultural shift perspective (this isn't a knock, I just don't know because the majority of new urban areas are still designed in old school methods). It's my hope, and my goal in the way I've organized my book, to re-energize and go a step further in cultivating a bluestem roots progressivism in garden design, and one that sees itself using the tools of other social and environmental justice movements. It's through such action that we learn to think more critically and begin to challenge and remold our animalistic brains that struggle with the long view, as well as the compassionate view for others -- and other species. I may fail horribly, though, and I can accept that if it happens. I will certainly turn on some folks and turn off others as I seek to complicate, invigorate, and push the garden conversation onward. But I hope that together we can all finally leap into a garden ethic that radically reunites us with the world again, because the real world is quickly drowning in our disconnection with it. It will take all of us together to bring wildness back into our everyday lives as well as in wilder places beyond our everyday lives. It will take homeowners, architects, nurseries, municipalities, federal or state government, and activists / artists whose job it is to make us feel uncomfortable and to speak up for the voiceless in our culture. Many new garden design opportunities are coming up, which excites me as I marry that burgeoning practice with the activism I profess in my forthcoming book. I'd still like to get a summer speaking gig on the books, and even one in the fall, as I have three in spring (Iowa, Wyoming, Michigan). In the meantime, I'm celebrating my favorite social media platform -- Instagram. Here are the top 9 photos of 2016. Have a favorite?